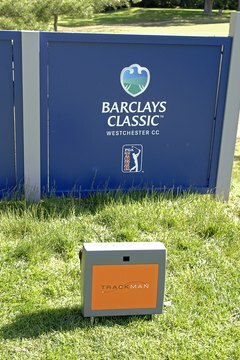 The TrackMan ball tracking system was instrumental in clarifying how club path and face position truly affected ball flight. The relationship between swing path and club face position is complex. Technically speaking, both affect the ball's flight at contact. But each has its greatest effect at a different point during the ball's flight. A better way to phrase this question might be "Does path or face have the most initial influence on ball flight?" The answer to that question has changed over the years. For decades most golfers believed that swing path had the most initial effect on ball flight. They thought that the swing path determined the direction in which the ball started. The angle of the club face imparted sidespin that -- once the ball was in flight -- determined where the ball would land. For example, if you wanted to slice your ball around a tree to a pin hidden behind it, you would aim the face of the club at the tree trunk but swing the club so the ball would miss the tree. Although it didn't always work, most players expected the ball to start its flight toward the left of the tree (for a right-handed golfer) and then slice right around it. As manufacturers began innovating new club designs, they started to question these traditional beliefs. New technologies, such as TrackMan, combined with high-speed photography, allowed them to measure the behavior of the ball at the moment of impact and immediately thereafter. Their discoveries, which challenged the way the game had always been taught, caused murmurs in the golf teaching community. Eventually the evidence proved too solid to ignore, and teachers began to teach what are sometimes called "the new ball flight laws." Those new laws say the position of the club face at impact has the most initial effect on direction while the swing path imparts sidespin to the ball -- exactly the opposite of the traditional view. Short game instructor Dave Pelz was an early adopter of the new rules, including them in his "Dave Pelz's Putting Bible," in which he noted that when the putter's face was square to the target line swing path was responsible for only 17 percent (roughly one-sixth) of the errors in missed putts. That 17 percent figure matched the findings about full swings. For the weekend player, this knowledge means that a squared face -- a club face pointing directly at the target -- has more initial effect on the ball flight than the swing path. If you were to aim the club face at a tree and swing on a path 12 degrees to the side, the ball would start its flight only 2 degrees to the side -- and probably hit the tree. The new ball flight laws suggest the face angle has the most initial influence on the ball's flight, so you should not aim at any obstacle you want to miss.